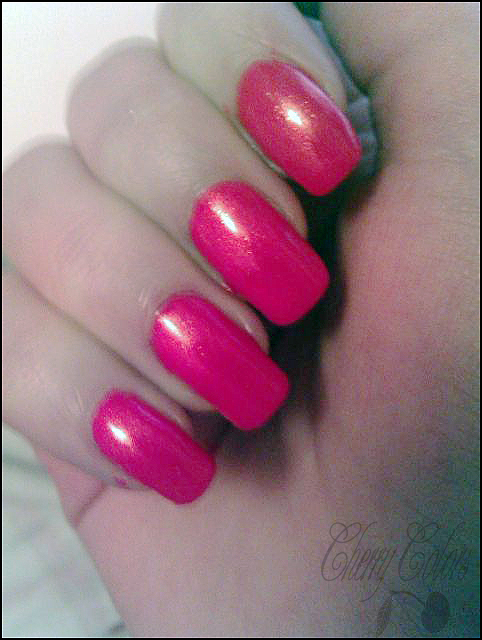 Back to short nails :( - Cherry Colors - Cosmetics Heaven! So I had long nails. The longest I've ever had! And what happened?! Well you see, I'm a very clumsy person. I randomly bump into objects and this is how I managed to crack two of my nails. Thrice. First one broke diagonally from the end of my nail to the part where the nail bed ends... I couldn't shorten them because if I did, they would be super short. That's why I decided to leave them be and apply another coat of nail polish. The second nail broke when I was checking what to wear in my wardrobe. I hit a hanger. Hard. I decided that it's not the case to shorten them again, even if this one also broke diagonally! And the third time happened during the weekend when I was working. I have no idea how, but one of the nails that were already broken, broke again! Terrible! This time I couldn't wait any longer (alright I waited for 2 more days, covering them with another layer of nail polish lol), so I cut them off. And my nails right after! I have to get used to them again. Now it takes me a while to write a damn SMS (text message) which is driving me crazy! I can feel the part that my nails were covering before, it's very tender. Terrible. I want my long nails back :(! I won't forget what a customer asked me last week "How can you do ANYTHING with those nails?!".. Uhm, excuse me? Tho I also got a lot of compliments on them (from a 5 year old girl, and two girls that were my age) which is unusual. I seldom get compliments on my nails (except from people that love manicures!). Oh well... it will take a could of weeks to get back to that length, but that's how life is ;P. When there's something broken in your life.. you just cut it off and you don't try to hide it or ignore it.